This weekend's November Swap will be kinda low key as we focus on getting ourselves ready for the Spring Garden Fiesta on 9th November - see below. The usual Edible Swap Table, Community Plant Nursery and Popup Cafe will all be open and operating for your affordable enjoyment, purchases and pleasure. The bread oven will be fired up for your sourdough experiments so bring them along to be cooked up. If you have some spare energy and time there will be opportunity on Saturday to help out with some site preparation tasks like weeding and general tidying up. Look for Ross or Tash during the morning. Chookchat @ Chookville will be hosted by Paul - come along to share and learn chook wisdom with others. From 11am. Join us this Saturday, November 2nd, 10am - 12pm for the Coburg Home-Grown Edibles Swap at PepperTree Place. The annual Fiesta is a chance for community to enjoy its local garden in full bloom with a popup cafe, veg and meat barbeque to keep people fed and watered. Free entertainment on stage as well as workshops for adults and kids throughout the day include the Fabulous Zucchini Clan (pictured), The Night Before Tomorrow, the Tarentella School of Dance, Vardos, The Black Harrys and local Coburg choirs. Free workshops on Growing Summer Bumper Crops by Diana Cotter; Unusual Edibles by Chris Williams, Zero Waste Challenge by Tammy Sherer, Successful worm farming by Worm Lovers - Richard Thomas and the science of composting with Matthew Daniel. Visitors will have the chance to explore the community nursery and buy affordable plants and spring vegie seedlings, check out the chooks and take part in a number of kids' activities throughout the day. 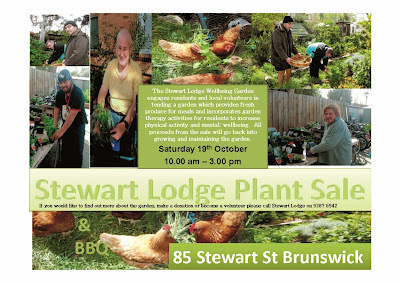 All proceeds from Swap Saturdays promote the growth of People-Plant projects at PepperTree Place. So please help plant the seed! Moreland Community Gardens Tour 2013 - All Welcome! Last year in August we organised a tour of 5 community gardens in Moreland for the members of the various gardens. It was lots of fun, interesting, inspiring, a bit exhausting for those on bikes and we made some new friends as a result. We've managed to organise another tour of the same community gardens this year and agreed on Saturday 23rd November as THE DAY. This year is we'll share the tour with a wider audience - we'll be opening the tour up to everyone! It'll be a chance for you to come and see what we're all up to at our various gardens in Moreland and find out how to get involved. We hope you can come along. We'll get in touch with those who RSVP to provide more information closer to the date. Registrations are now open for the 2013 Darebin Backyard Harvest Festival! Darebin's Backyard Harvest Festival is back again this November with a range of exciting events to inspire people to create their own food gardens. Presented by Darebin City Council in partnership with Darebin Ethnic Communities, the Backyard Harvest Festival kicks off on Sunday 10 November in a celebration of home food-growing traditions from around the world. This is your chance to tour 14 impressive home gardens around Darebin and participate in five great workshops, covering everything from worm-farming to food preserving and raising chickens in your backyard. Darebin's Backyard Harvest Festival is free for Darebin residents and only $10 per event for Non-Darebin residents. It runs from 10 November to 1 December 2013. REGISTRATIONS ARE ESSENTIAL as numbers are limited so BOOK EARLY! Home garden locations are provided at the time of booking. For the full Darebin Backyard Harvest program, and to register, visit www.darebin.vic.gov.au/backyardharvest. Check out this video prepared for last year's festival. 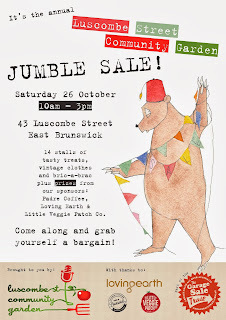 Luscombe Street Community Garden proudly presents our second Garden Jumble Sale! 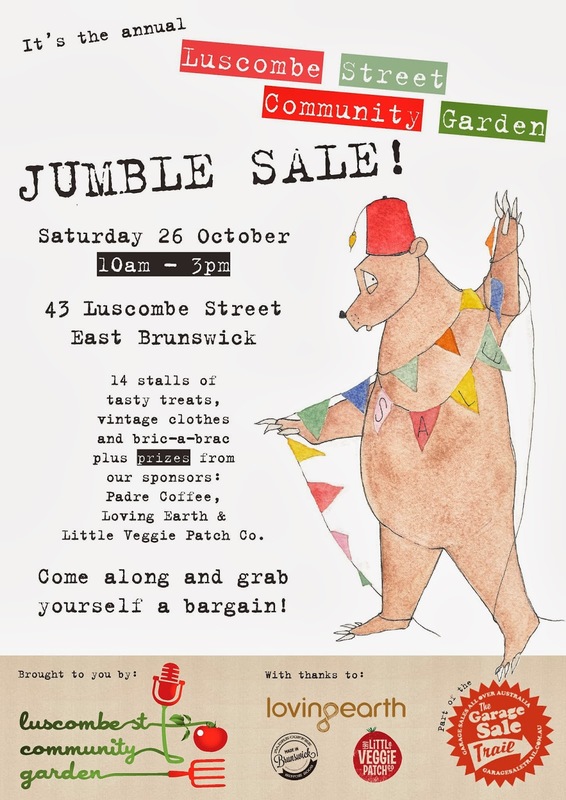 Last year we had a hoot converting our green veggie oasis into a treasure trove of pre-loved and vintage clothing, bric-a-brac, records, books, sweet treats and crafty goodness and we're doing it all again. This year we're tying in with the 2013 Garage Sale Trail, an event that promotes sustainability and community connection. Come along to check out our lovely green space, score yourself a bargain and grab a bacon 'n egg roll from the BBQ. We'll also be selling heirloom vegetable seedlings propagated in our very own propagation tent. All proceeds go straight back into the garden. We'd love to see you there! Stewart Lodge is a supportive residential service for over 80 residents who might otherwise not have a place to call home. The Stewart Lodge Wellbeing Garden engages residents and local volunteers in tending a kitchen garden which provides fresh produce for meals and incorporates garden therapy activities for residents to increase physical activity and mental wellbeing. All proceeds from the sale will go back into growing and maintaining the garden. 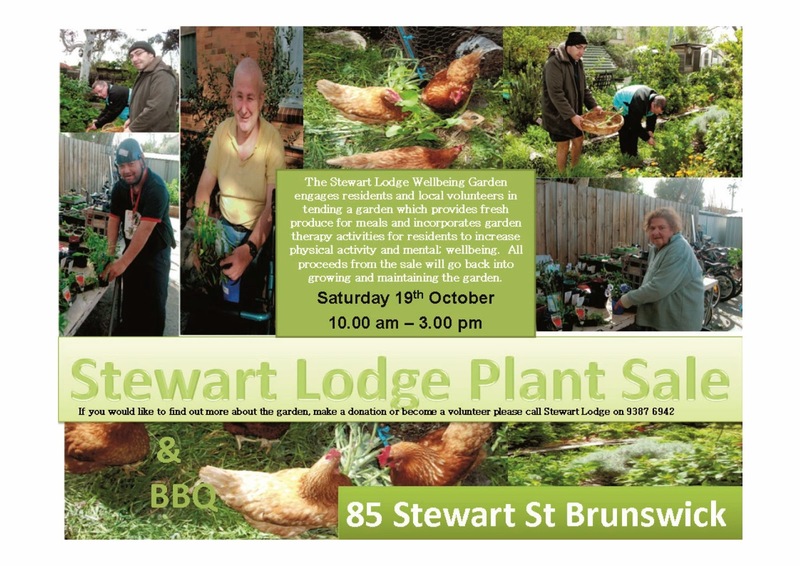 If you would like to find out more about the garden, make a donation or become a volunteer please call Stewart Lodge on 9387 6942. Nearly half of Moreland's landfill waste is food! Can you Zero your Waste for a Week? Food waste is a huge problem, locally, nationally and globally. In Moreland around 29,000 tonnes of waste goes to landfill annually, almost half of this is food waste! Australians throw away an estimated $5.2 billion worth of food every year, or one in five bags of the food they purchase. When food waste breaks down in landfill it produces the harmful greenhouse gas, methane. This gas is 23 times more potent than the carbon dioxide that comes out of your car exhaust. Using a compost bin or worm farm for the food waste you do produce is a great way to reduce waste to landfill and recycle nutrients back into your garden. However, what is even better than recycling your food waste is to avoid creating it in the first place. Food waste avoidance saves all the water, energy and non-renewable resources that went into getting that food from the farm to your plate. Food waste avoidance means only buying what you can use, being creative with what you have in the cupboards and getting your storage right to get the most out of your food. Moreland residents! Take the Zero Waste for a Week Challenge this November and reduce your landfill waste to zero for one week. It’s not as hard as it sounds, changing the way you buy goods and produce, composting food scraps and recycling more all make a huge difference. Free workshops will be available throughout November on food waste avoidance and composting to help you cut your waste to zero. Please note that registration for the challenge is only open to Moreland Residents but information is open to everyone, visit the website for some great Zero Waste tips! PepperTree Place will be open from 10am-12pm tomorrow morning, 5th October brimming with all things Spring and Seasonal. The Community Plant Nursery will have a staggering array of Heirloom Vegie Seedlings available at very plantable prices! Get your Tomatoes, Capsicums, Chilies, Basil and Eggplant while the night air temperature gains momentum. Also to keep in mind the PepperTree's Garden Fiesta is coming on Saturday the 9th November, 10am-4pm. We are looking for plenty of Voluntary Help leading up to this event as well as on the day if you can. There is a huge variety of jobs to cover on the day from preparing and serving food, to setting up decorations, handling plants and sales in the Community Nursery, manning the Information Stall to helping out with kids activities.